Beautiful ladies, handsome men, luxury brands, enthusiasm and temperament – we are presenting you fifteenth year of prestigious and unique beauty contest Miss & Mr. LOOK BELLA 2018. This competition is full of attractive ladies and handsome men and is formed based on Western European format of beauty contests and by this opens door to world of modelling not only to ladies but also to young men. So do not hesitate to sign up! From casting for Miss & Mister Look Bella 2018 straight to worldwide magazine covers! Model Veronika Krajplová, patron of XVth LOOK BELLA 2018 was an absolute winner of Look Bella in 2012. Since than she started successful modelling career at large! She did photo shooting in wonderful New York, in Paris or in London. Veronica´s smile lightened covers of popular Czech and foreign magazines like Cosmopolitan, Marianne or Žena a život. She was also part of worldwide ad campaigns for brands like MAC or Swarovski. So come to the casting and BE DISCOVERED JUST LIKE Veronika! Sixth most handsome male of planet will be attending castings for Miss & Mr. Look Bella 2018! 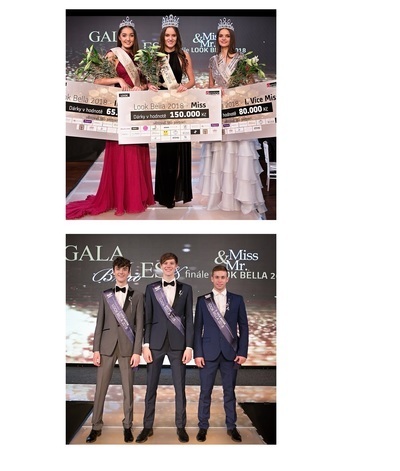 Patron of already XVth beauty contest Miss and Mister LOOK BELLA 2018 is namely Antonín Beránek, who won in 2010 Look Bella, after that he became Man of the Year 2013 and in the same year he also became Most Handsome Male of Europe. Antonín is currently working the most in Asia, where he also spends majority of year. But you may meet him in Europe. His successful modelling career brought him to Munich or fashion centre Milan. His face was on covers of worldwide magazines e.g. Esquire, Cosmopolitan or Harper´s Bazaar. You may also see Antonín in prestigious worldwide ad campaigns! Nationwide companies like Durex, Samsonite or French cosmetics Lovea bet on his manly charm. 292114044Miss Look Bella 2018 Terezie in front of Jiří Šubrt's cameraTerezie Jastzemská Miss Look Bella 2018 posed in front of the camera of well known photographer Jiří Šubrt. As a result there are wonderful photos of our beauty queen. prohlédnout další 201932014330201932014352010447000en00000000-00-00 00:00:000000-00-00 00:00:0013130https://www.look-bella.cz/en/clanky-v-paticke/0Články v patičkehttps://www.look-bella.cz/en/clanky-v-paticke/?nid=292-miss-look-bella-2018-terezie-in-front-of-jiri-subrt-s-camera.htmlhttps://www.look-bella.cz/en/clanky-v-paticke/292-miss-look-bella-2018-terezie-in-front-of-jiri-subrt-s-camera-a.htmlmiss-look-bella-2018-terezie-in-front-of-jiri-subrt-s-camerahttps://data.get-webseller.com/113965/www/www.look-bella.cz/articles/main/292_main_290_main_54369222_1442400439230390_6243760873509224448_n-1552644074-1553088982.jpghttps://data.get-webseller.com/113965/www/www.look-bella.cz/articles/292_main_290_main_54369222_1442400439230390_6243760873509224448_n-1552644074-1553088982.jpghttps://data.get-webseller.com/113965/www/www.look-bella.cz/articles/preview/292_prev_290_main_54369222_1442400439230390_6243760873509224448_n-1552644074-1553088984.jpghttps://data.get-webseller.com/113965/www/www.look-bella.cz/articles/292_prev_290_main_54369222_1442400439230390_6243760873509224448_n-1552644074-1553088984.jpgTerezie Jastzemská Miss Look Bella 2018 posed in front of the camera of well known photographer Jiří Šubrt. As a result there are wonderful photos of our beauty queen. Vol. XVth of prestigious beauty contest just starts! Registration on website www.lookbella.cz is already running and organizing agency PRESTIGE MODELS starts the competition in September, terms of castings dates will be published stepwise. All you have to do is take courage, register, come to the casting, win and by that start your dream journey into the world of professional modelling. Patron and face of last year´s contest were beautiful model Lucie Kovandová, that was happy to meet every single one of you on each casting, where were waiting for you gifts from partners and lots of fun. Miss Look Bella brought a crown from Soul Winner Look Bella 2018 headed to Korea! Will she win world beauty contest? Agency Prestige Models s.r.o. was founded in 2004 and thereafter organized more than 2 000 events for both Czech and foreign clients. One of the biggest events of agency is beauty contest Look Bella, which is on the market already for long 15 years. We are conducting also Czech Snow Polo Masters – the only horse polo on ice in Czech Republic, that is being organized. Years of practise and experience lead to the fact that every event organized by us is for our client carefree and full of fun. Would you like to cooperate with us, do You want to be our clients? Don´t miss all new castings, auditions and interesting events.